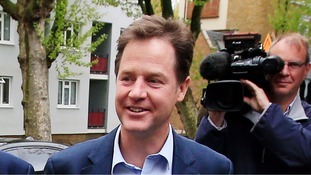 Deputy Prime Minister Nick Clegg has told reporters that he believes there is "no need" for the £9,000 limit on university fee's to be changed again. 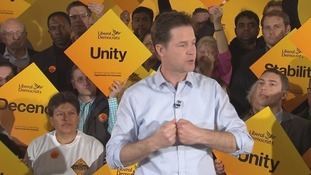 Speaking while on his campaign bus today Clegg said: "I see no need to change the limit again. Labour, perhaps by their own admission, have concocted this new approach - as a politician I understand it - to exacerbate the Liberal Democrat embarrassment. "They want to catch headlines, they want to score points, but nobody remotely serious - Vince Cable's been very articulate on this - thinks that the Labour policy does anything in real terms other than provide a more generous repayment schedule for the wealthiest graduates." 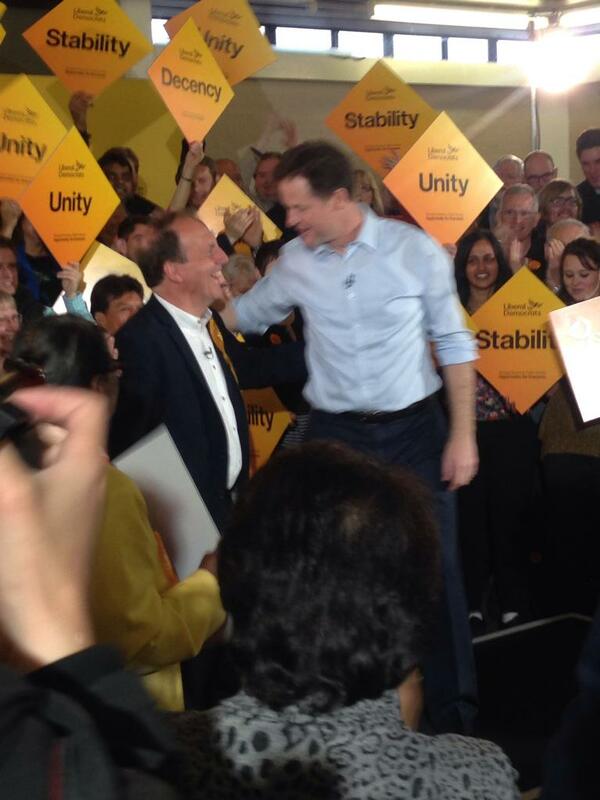 Nick Clegg raised a glass to the royal baby while out on the last few days of his campaign trail. The deputy prime minister made the toast while visiting the Hush Heath Winery in Kent. He said: "I think before we should sip we should raise a glass to the royal baby with some proper English sparkling. To the royal baby." Nick Clegg refused to clarify what his position would be if the Tories demand an in/out EU referendum in 2017 as part of a future coalition. Speaking on the BBC's Andrew Marr Show, the Liberal Democrat leader said: "The Conservatives constantly flip-flop on this....it's about as cast-iron as what he said about the Lisbon Treaty", he added. 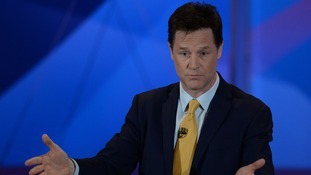 When Marr asked if he would agree to David Cameron having his referendum on Europe in 2017 in any further coalition deal, Mr Clegg said: "Before I address anyone else's red lines, I would address mine". "I personally think that for many many people...ensuring fair tax cuts for low and middle incomes, that we properly support the NHS, that we don't close their local nursery schools and colleges is much more important than some of the other red lines that other parties have chosen".